Probably it is the first time that a ship launch includes a political statement. 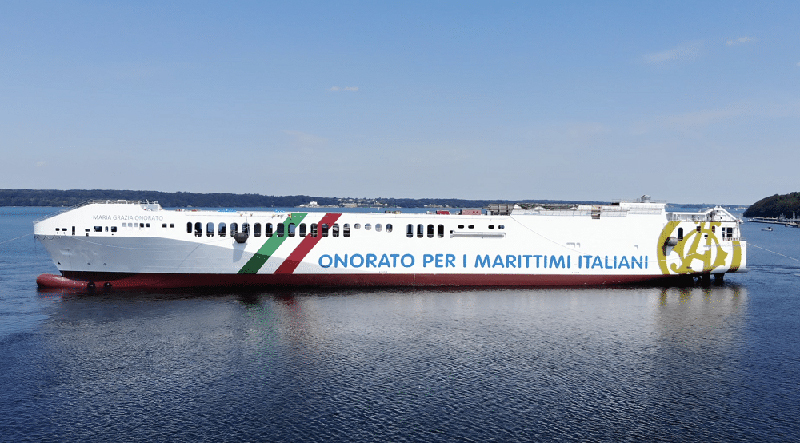 When shipowner Vincenzo Onorato launched ro-ro vessel MARIA GRAZIA ONORATO at the Flensburg FSG shipyard, he also launched a petition in defense of Italian seafarers on Italian ships. The ship acted as manifest, with the slogan “Onorato for the Italian Seafarers” painted on the hull (in Italian). He also asks non-EU seafarers to comply with maritime work in Italy and the E.U. Contracts of non-EU staff on Italian ships in international service must be standardized to those of Italian / EU seafarers. Safety standards must be guaranteed and verified for all seafarers.